If you work with pre-teens or teens in any capacity, it’s a safe bet you’re aware of a controversial web television series titled 13 Reasons Why. Based on a 2007 novel by the same name, the series revolves around a teenage suicide, influenced by a series of demoralizing events involving select students at the victim’s school. The story chronicles a box of cassette tapes recorded by the victim prior to her suicide, detailing thirteen reasons why she ended her life. Given the work I do, I completely understand the need for meaningful dialogue on the topic of suicide. However, I’m not sure a movie such as this is the appropriate means by which this conversation should start. Note that I chose the word start. I’m not condemning those who’ve watched the film as it may very well serve as a great source of discussion with kids. My biggest concern is the way in which it’s portrayed – a revenge fantasy of sorts. If the goal of the film is to increase awareness on this topic, then it’s been a huge success. However, if the goal is to address the root cause of most suicides, mental health, then it’s failed miserably. If you’re an average teenager watching this show, do you walk away from the series feeling empowered or equipped to tackle the countless social and emotional challenges of the teenage years? My guess is you may feel educated, but not empowered or equipped. In fact, I would argue that many teenagers may use the film as a means of justification or fuel for a victim mentality. In other words, instead of looking inward for the true source of change, their focus will remain on what others have done. 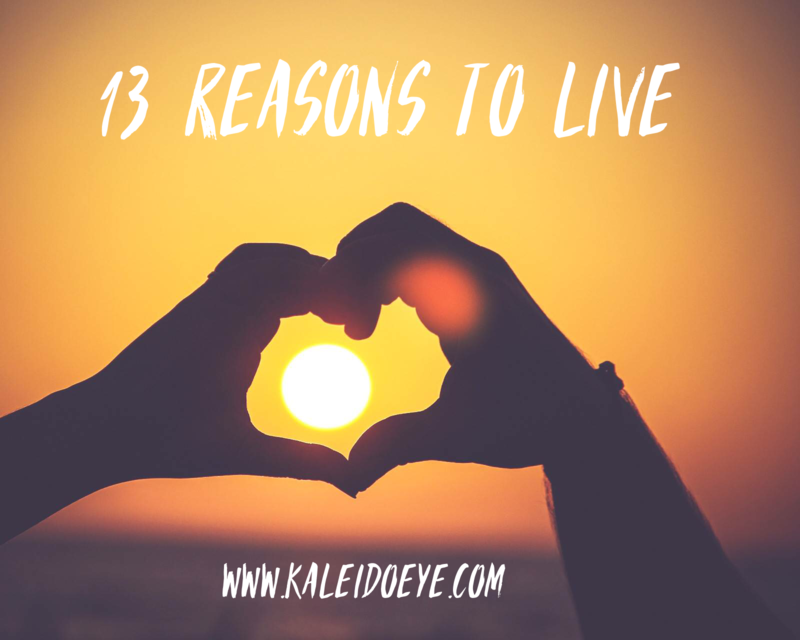 Regardless of your opinion of the film, I think we can all agree that there are more than 13 Reasons Why everyone should live. My sincere hope is that the following list will serve as a source of empowerment (or hope) for anyone who finds themselves in a dark place. Reason #1 – You are a miracle. The odds of you being born in the time, place, and circumstances under which you were born are 1 in 400,000,000,000. Your name should be Miraculous Me. Reason #2 – Someone needs your gifts. Each of you have special gifts that are uniquely yours. Step one is to uncover your gifts and step two is to share them with the world, regardless of others opinions. Reason #3 – Your smile can change the direction of someone’s life. You matter. Smiles are contagious and spread just like sick germs. When you smile, you shine your light. Whether you realize it or not, you make a tremendous difference for others. Reason #4 – Your value doesn’t change based on someone’s inability to see your worth. If you wrote down the largest dollar amount you can think of, then multiplied it by one million, you wouldn’t even come close to your value. Reason #5 – God started something good in you and the rest of the story is yet to be written. Don’t stop on Chapter 2 when future chapters contain breakthroughs that will take you places you never imagined. Reason #6 – Your feelings aren’t a good indicator of reality, but rather a gauge of your perceived reality. Anger and sadness are natural human emotions, but they don’t have to influence your choices. Let your values be your guide. When you change your lens (perspective), you change your life. Reason #7 – No one has the power to make you feel a certain way, unless you give them permission to. Your mind is a beautiful 5-star resort. There is no vacancy for negativity. Reason #8 – Your brain tends to dwell on the past or fear the future, but the only time you really have is right now – the present. It truly is a gift. Stop what you’re doing right now and look at the people and things around you. Listen to the sounds in the air. They’re all gifts. Reason #9 – You ‘re not alone. There is someone else going through a similar circumstance at this exact moment. Be vulnerable enough to share your story. There are people who are willing to listen and understand. Reason #10 – Suffering leads to strength. You will suffer. We all do. However, you’re not defined by your suffering. In many cases, suffering happens for you, not to you. Reason #11 – Change doesn’t happen overnight. We live in a world of instant gratification. We want things to change and we want them to change now. Remember, it’s THY will be done, not my will be done. Reason #12 – We must fall so that we can learn how to get back up. You can’t truly understand something unless you’ve experienced the opposite. You can’t know light unless you’ve been in the dark. Reason #13 – I love you. Some of you might be thinking, “He doesn’t even know me. How can he love me?” Jesus taught me to love my neighbors and although we may live miles apart, you are my neighbor, therefore, I love you. If you’re a parent, teacher, coach, mentor, or work in any other capacity with young people, I invite you to use this list as a means of discussion. While the movie may speak to their heads, this list will almost certainly speak to their hearts. P.S. I’d love to hear your feedback. I realize there are varying opinions regarding this film. I’m open to your insights. Please use the comment section below to share. Thank you Mike! I read your FB post a few days ago and I agree with you. After reading your FB post I put my cellphone down and asked my 11 year old if she knew what suicide meant, she did not know. So needless to say we started our conversation. So thank you for noting the word start! Thank you, Genniva. I’m glad this sparked a conversation that will hopefully empower her in the future. Thank you, Kristin. I’m passionate about empowering teens and my sincere hope is that this blog will lead to discussions regarding suicide prevention, not just awareness.